04 Mar 2019 A programmed maintenance will stop REM operations from 13th March to 24th March. We sorry for inconvenience. 02 Feb 2019 The OPTICON call for Trans-National Access in semester 2019B is open. The deadline is 28 Feb 23:59 UT. All informations and warning are here. For the submission form please follow the Proposal link. 20 Oct 2018 Call for proposal INAF AOT39 (2019A) is open. The deadline is 23 Nov 2018 at 12:00 UT. All informations and warning for REM are here. For submission package and form please follow the Proposal link. 02 Aug 2018 The OPTICON call for Trans-National Access in semester 2019A is open. The deadline is 02 Sep 23:59 UT. All informations and warning are here. For the submission form please follow the Proposal link. 20 Apr 2018 Call for proposal INAF AOT38 (2018B) is open. The deadline is 18 May 2018 at 12:00 UT. All informations and warning for REM are here. For submission package and form please follow the Proposal link. 20 Feb 2018 The OPTICON call for Trans-National Access in semester 2018B is open. The deadline is 28 Feb at 23:59 UT. All informations and warning are here. For the submission form please follow the Proposal link. 29 Jan 2018 REM AOT37 approved programmes are listed in the GREEN list. Please contact REM team (info@rem.inaf.it) for the phase II. 19 Oct 2017 Call for proposal INAF AOT37 (2018A) is open. The deadline is 17 Nov 2017 at 12:00 UT. All informations and warning for REM are here. For submission package and form please follow the Proposal link. 16 Oct 2017 REM GOT IT !! 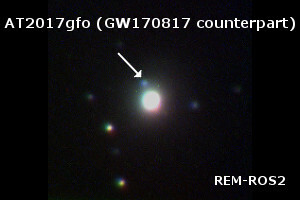 REM caught the source of the gravitational wave GW170817 with its blue kilonova, contributing to the birth of a new astronomy. REMultimessenger !! 01 Oct 2017 REM AOT36 approved programmes are listed in the cyan list. Please contact REM team (info@rem.inaf.it) for the phase II. 18 Apr 2017 Call for proposal INAF AOT36 (2017B) is open. The deadline is 19 May 2017 at 12:00 UT. All informations and warning for REM are here. For submission package and form please follow the Proposal link. 01 Apr 2017 REM AOT35 approved programmes are listed in the light gray list. Please contact REM team (info@rem.inaf.it) for the phase II. 14 Mar 2017 REM stopped operation for a maintenance period, until March 26. 20 Oct 2016 Call for proposal INAF AOT35 (2017A) is open. The deadline is 30 November 2016 at 12:00 UT. All informations and warning for REM are here. For submission package and form please follow the Proposal link. 10 Jul 2016 REM AOT34 approved programmes are listed in the SAND list. Please contact REM team (info@rem.inaf.it) for the phase II. 15 Apr 2016 Call for proposal INAF AOT34 (2016B) is open. The deadline is 16 May 2016 at 12:00 UT. All informations and warning for REM are here. For submission package and form please follow the Proposal link. 20 Mar 2016 Your REM telescope is again again online. PIs of the last&lost semester have been notified that they can observe now. 22 Sep 2015 We are really sorry to tell you that REM operations are STOPPED until further notice, due to a major failure after yet another storm. Recovery time may be 1-2 months. Stay tuned. 25 Mar 2015 After a whole semester without some vital parts, the REM telescope is now again online. PIs of the last&lost semester have been notified that they can observe now. 27 Jul 2015 REM AOT32 approved programmes are listed in the GREEN list. Please contact REM team (info@rem.inaf.it) for the phase II. 20 Jul 2015 Programmed maintenance will stop REM operations from 20 July to 1st August. Sorry for inconvenience. 20 Apr 2015 Call for proposal INAF AOT32 is open. The deadline is 18 May 2015 at 12:00 UT. All informations and warning for REM are here. For submission package and form please follow the Proposal link. 06 Feb 2015 REM AOT31 approved programmes are listed in the GREY list. Please contact REM team (info@rem.inaf.it) for the phase II. 20 Oct 2014 Call for proposal INAF AOT31 is open. The deadline is 17 November 2014 at 12:00 UT. All informations and warning for REM are here. For submission package and form please follow the Proposal link. 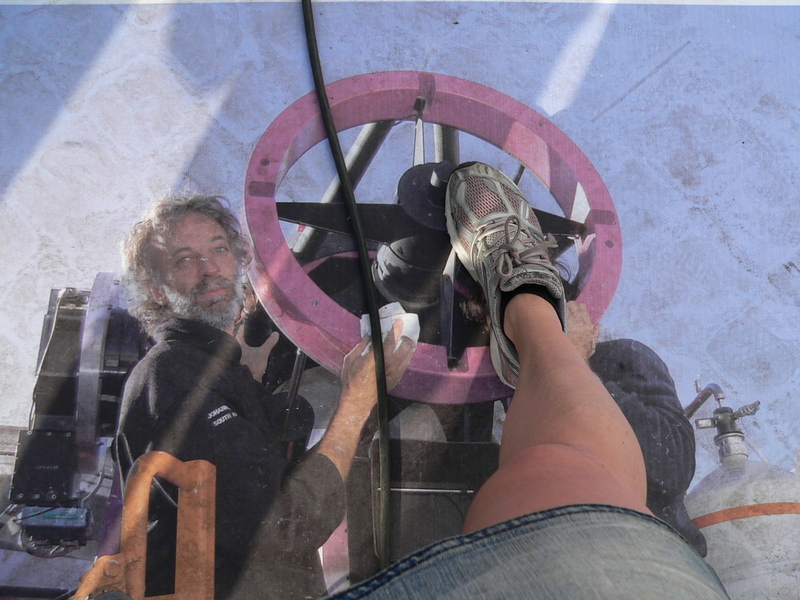 14 Aug 2014 After a whole semester whitout some vital parts, the REM telescope is now again online (see PHOTO). PIs of the last&lost semester have been notified that they can observe now. 18 Jan 2014 Due a strong lighting storm the REM operations are stopped until new communication. 05 Nov 2013 A preliminary exposure time calculator for our instruments is now available. Please click on the left menu the ETC tag. 11 Oct 2013 Call for proposal INAF AOT29 is open. The deadline is 15 November 2013 at 12:00 UT. All informations and warning for REM are here. For submission package and form please follow the Proposal link. 07 Aug 2013 REM AOT28 approved programmes are listed in the RED FRUIT list. Please contact REM team (info@rem.inaf.it) for the phase II. 24 Jun 2013 REM comes back fully operational: both instruments are working. Many thanks for your patience. 20 May 2013 In view of the next month major maintenance all operations have been stopped. 20 Apr 2013 Infrared camera REMIR is again operational. ROS2 will need some more time. 10 Mar 2013 We are sorry to inform that a severe failure in the TCS computer is stopping REM operations. We are working hard to restore the situation. 28 Dec 2012 REM AOT27 approved programmes are listed in the SAND list. Please contact REM team (info@rem.inaf.it) for the phase II. 19 Nov 2012 Due to ROS2 commissioning and few regular maintenence, REM operations are now stopped. 17 Sep 2012 INAF AOT27 for proposal is open. The deadline is 19 Oct 2012 at 13:00 UTC. All informations and warning for REM are here. For submission package and form please follow the Proposal link. 23 Aug 2012 The commissioning of the new visible camera ROS2 is continuing. From now REM will be again operating but still with infrared arm REMIR only, until futher notice. 26 Jul 2012 Programmed maintenance and planned instrument upgrade will stop REM operations from 31 July to 21 August. The AOT26 period will start on August 22nd. Sorry for inconvenience. 18 Jul 2012 REM AOT26 approved programmes are listed in the TURQUOISE list. Please contact REM team (info@rem.inaf.it) for the phase II. 01 Jun 2012 ROSS stopped due CCD problem. 13 Mar 2012 INAF AOT26 for proposal is open. The deadline is 16 Apr 2012 at 13:00 UTC. All informations and warning for REM are here. For submission package and form please follow the Proposal link. 02 Mar 2012 Programmed mirrors realuminization will stop REM operations from 06 March to 19 March. Sorry for the inconvenience. 02 Jan 2012 REM AOT25 approved programmes are listed in the SALMON List. 07 Dec 2011 REM activity is restored. 10 Nov 2011 REM activity is stopped due telescope motors problems. 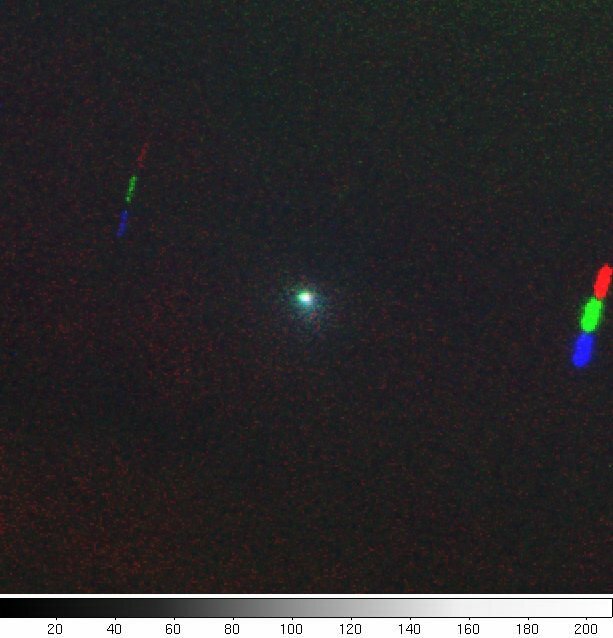 19 Oct 2011 REM catches a relativistic jet from the black hole candidate GX 339-4. Press releases INAF (Italian only) and NASA. 21 Sep 2011 The R.E.M. band shuts down, we don't. 17 Sep 2011 INAF AOT25 for proposal is open. The deadline is 14 Oct 2011 at 13:00 UTC. All informations and warning for REM are here. 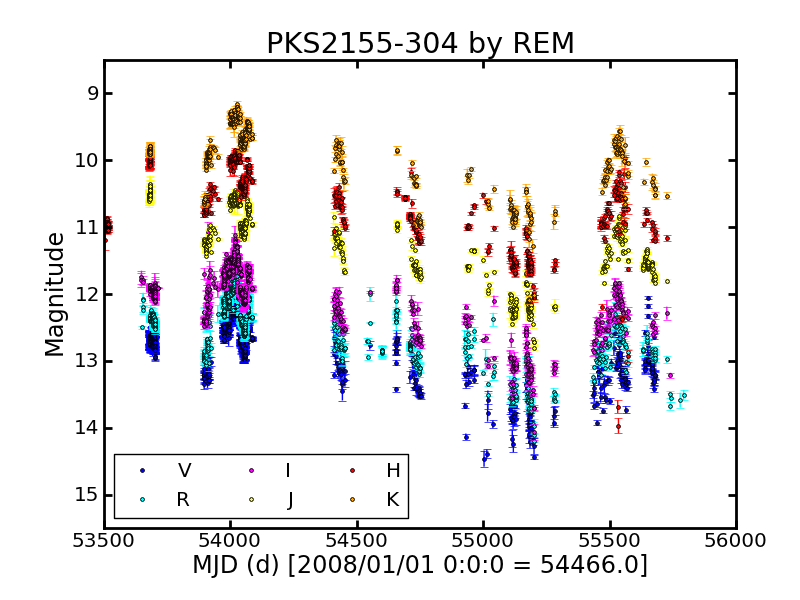 25 Aug 2011 PKS 2155-304: six years of multicolor observations by REM. 4 Aug 2011 REM activity is restored. 20 Jul 2011 REM activity is stopped due telescope system problems. 29 Jun 2011 REM AOT24 approved programmes are listed in the VIOLET List. 22 Jun 2011 Record of images number taken in one night: 1989 images (ROSS: 409, REMIR: 1580). 19 May 2011 REM activity restored. 2 May 2011 REM activity is stopped due to an hardware problem on the control system. 6 Mar 2011 INAF AOT24 for proposal is open. The deadline is 15 Apr 2011 at 13:00 UTC. 13 Dec 2010 Another pipeline is possible! REM automatic post-observation pipeline gives the zeropoints in all filters. See Calib ZERO in the menu on the left. 15 Nov 2010 REM activity restored. 10 Nov 2010 Due to a major hardware problem REM activity is stopped. 15 Sep 2010 REM AOT23 for proposal is open. The deadline is 15 oct 2010, 13H UTC. Submission packages on www.tng.iac.es. 8 Sep 2010 With a spare controller the REMIR camera IS ALIVE AGAIN. We are recovering the normal operational mode for infrared observations. Thank you for your patience. 20 Aug 2010 Maintenance terminated. Unfortunately, due to techincal failure, the infrared camera Remir IS NOT OPERATIVE until further notice. PIs can contact info@rem.inaf.it for details. 29 Jul 2010 Programmed seasonal maintenance will stop REM operations from 29 July to 12 August 2010. Sorry for the inconvenience. 19 Jul 2010 REM AOT22 approved programmes are listed in the GREEN List. 16 Mar 2010 INAF AOT22 for proposal is open. The deadline is 16 Apr 2010 at 13:00 UTC. 13 Mar 2010 REM STOP for maintenance cancelled. Observatin will continue regularly. 1 Mar 2010 All the communications restored. REM continued regularly scheduled operations during internet black-out. Some problems with REMIR filter wheel may have caused filter name mismatch: PIs are notified. 27 Feb 2010 After 6:30 UT we lost connection with REM dome, see our plot in Merate. The REM team is close to Chilean people in this strong moment. 1 Jan 2010 REM AOT21 approved programmes are listed in the GREY List. Also Chilean CN-TAC programmes are included. 7 Oct 2009 INAF AOT21 for proposal is open. The deadline is 30 Oct 2009 at 13:00 UTC. Please follow the Proposal link in our pages. 24 Jul 2009 Programmed seasonal maintenance will stop REM operations from 30 July to 11 August 2009. Sorry for the incovenience. 24 Jun 2009 REM AOT20 approved programmes are listed in the Orange List. Also Chilean CN-TAC programmes are included. 10 Jun 2009 REM is no. 20 in the 20 top cited paper about GRB. ScienceWatch.com placed the fast, pink telescope among the 20 most cited papers in the past 2 years. Look at their page. 23 May 2009 In a special day ;) we are again trampled together with the other faces of the Italian Research. See our gallery, a full photo (S. Piranomonte, photo and leg) and the web site. 14 May 2009 The REM Archive reached 1 million images!!! look the graph. 30 Apr 2009 Call for proposal AOT20 is closed. INAF-TAC begins scientific evaluation. 27 Mar 2009 INAF AOT20 for proposal is open. The deadline is 28 Apr 2009 at 13:00 UTC. Please follow the Proposal link in our pages. 30 Jan 2009 REM AOT16 images go public! One year after AOT16 completion (1 Feb 2008) REM data become public and can be freely accessed via REM archive. These public images are also incorporated into the IA2 INAF archive in Trieste. Last but not least, a new, common data policy has been approved by INAF for all three telescopes: REM, TNG and LBT. Read more in the REM ARCHIVE page (menu on your left). 3 Jan 2009 REM AOT19 approved programmes are listed in the Yellow List. Also Chilean CN-TAC programmes are included. 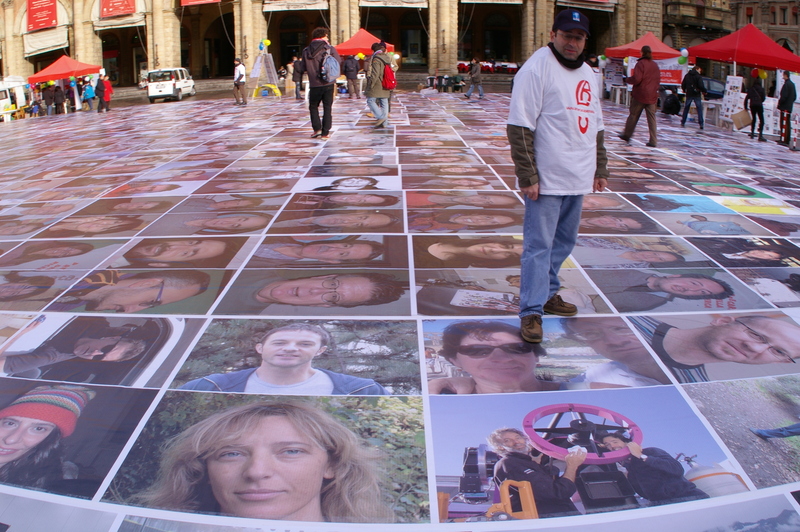 29 Nov 2008 REM image to be trampled together with the other faces of the Italian Research. See our gallery, a full photo (L.Nicastro) and the web site. 16 Nov 2008 TAC-INAF to evalate REM AOT19 proposals in Firenze on 19/21 November 2008. Chilean CNTAC selected proposal entered REM system. 23 Sep 2008 REM AOT19 for proposal is open. The deadline is 30 Oct 2008 at 23:00 UTC. Please follow the Proposal link in our pages. 29 Jul 2008 REM operations will be stopped starting 30-JUL-2008 for a programmed period of maintenance. Your favorite telescope will come back after two weeks. 1 Jul 2008 Look at the LIST of approved programmes for the AOT-18. 22 May 2008 All proposal received within REM INAF-AOT18 will be evaluated by INAF-TAC in Padova on 3/4/5 June 2008. 5 May 2008 REM INAF-AOT18 for proposal is now closed. A total of 17 proposal entered sucessfully REM system asking a total of 1057 hours for ROSS and 1158 hours for REMIR. 17 Mar 2008 REM AOT18 for proposal is open. The deadline is 28 Apr 2008 at 23:00 UTC. Please follow the Proposal link in our pages. 6 Jan 2008 A comet also for REM in the right night! See near IR false colors image of comet 8P/Tuttle, thanks to Tozzi (INAF-AOT16001) & Fugazza (REM Team). You can even spot the three REMMagi. 24 Dec 2007 REM AOT17 approved programmes are listed in the Orange List. Also Chilean CN-TAC programmes are included. 21 Nov 2007 Great outburst of the old friend 3C454. Have a look at numbers and frames from REM Observatory. 29 Oct 2007 17 proposal for AOT17 successfully entered REM database. The files are now in the hands of TAC-INAF for evaluation, scheduled for 28-30 November 2007. Still waiting for Chilean time proposals. 24 Sep 2007 REM AOT17 for proposal is open. The deadline 8s 22 Oct 2007 at 18:00 UTC. Please follow the Proposal link in our pages. Please real the special notice. 7 Sep 2007 Great success of our team in Notre Dome. Both cameras are working and observations started last night. Happy journey back home! Thank you! also to ESO-REM musqueteers! 29 Aug 2007 REM full stop for REMIR and ROSS extraordinary maintenance. 10 Aug 2007 Planned maintenance mission to Chile late August. Already limited REM operation will be stopped starting 29 August 2007. 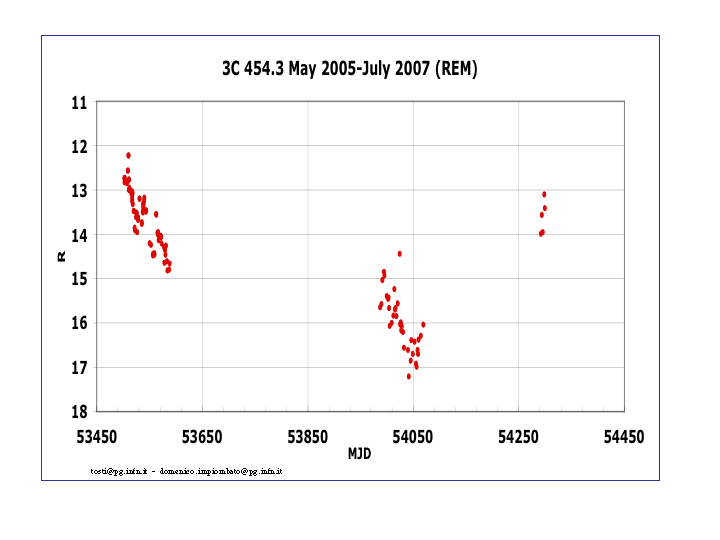 17 Jul 2007 3C 454.3 is in an high state, the REM observations obtained on 17 July show the source at a level of R=13.1 with a rising trend during the last days. A very high state (Fuhrmann et al. 2006 A&A, 445,1). During the big May 2005 outburst the source was R=12. but its minimum is around 16-17 mag. 10 Jul 2007 IR cooling system under maintenance in Cerro Paranal. No more IR observations are performed until further notice. 21 Jun 2007 Summer soltice and publication of REM AOT-16 approved programmes. Have a look at the Green List. 15 Jun 2007 REM operation stopped due to cryostat malfunction. In danger list until further notice (EM). 12 Jun 2007 ESO, INAF, Il Corriere, Repubblica press releases on REM results. 23 May 2007 AOT 16 proposals ander evaluation by INAF-TAC during dinner in Padova. 23 Apr 2007 REM AOT16 deadline postponed to 10 May 2007 at 13:00 UTC. 27 Mar 2007 REM AOT16 for proposal is open. The deadline is 22 Apr 2007 at 15:00 UTC. Please follow the Proposal link in our pages. Please real the special notice. 6 Feb 2007 RTOO on supernova SN2007S activated by M. Della Valle (prog AOT15-28). 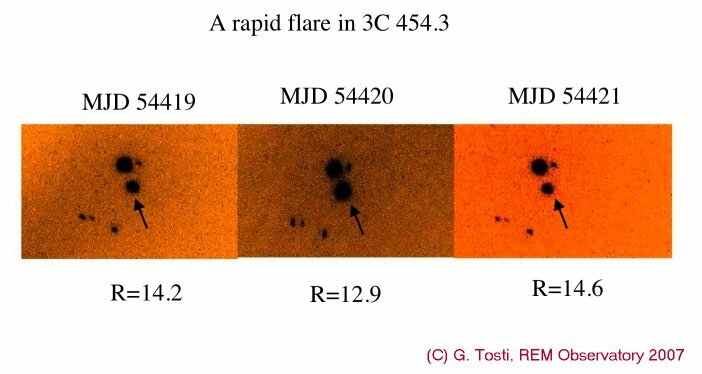 2 Feb 2007 First REM AOT-15 images successfully scheduled, Vitali's programme on Vela Cloud opened the season. 28 Dec 2006 REM-AOT 15 schedule. Guaranteed time and INAF-TAC programmes are listed in these pages. 22 Dec 2006 REM bright observations of GRB afterglow peak on astro-ph. 13 Dec 2006 REM bright observations of GRB afterglow peak on show at Australia meetings. 17 Nov 2006 User proposal to be evaluated by INAF TAC durign next weeks. 22 Sep 2006 REM AOT15 for proposal is open. The deadline is 16 Oct 2006 at 15:00 UTC. Please follow the Proposal link in our pages. We made all possible efforts to make this call for observing time as friendly as possible, but please allow us to be somewhat naive for this first time. 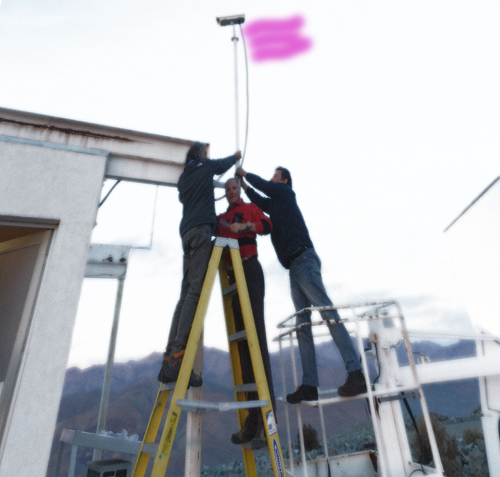 21 Sep 2006 We are pleased to announce that the REM Observatory, placed in Chilean ESO La Silla premises, is offered to the Italian astronomical community from January 2007. Soon an announce for AOT15 for REM will be made public and astronomers encouraged to applicate for telescope time. The INAF TAC, already in charge for TNG, will take care of proposal evaluation.